Is this the oldest photograph taken in Brooklyn? This Dutch-style farmhouse doesn’t look like it’s in great shape. But the man in the top hat is standing proudly in front of it on uneven ground beside an enormous tree. 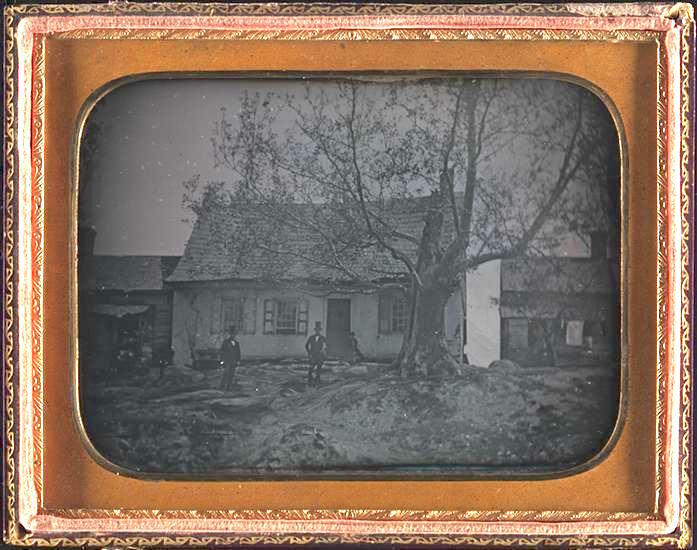 That man and a second man to the left are posing beside what’s described as “the First Meserole House” in Wallabout, Brooklyn, states the Art and the Empire City: New York, 1825-1861. This daguerreotype dates to 1848, according to the Museum of the City of New York. That could make it one of the oldest photographic images of Brooklyn, if not the oldest. Based on the image, it’s impossible to know exactly where it is in today’s Wallabout. But the house might not actually be Wallabout (above, in an 1840 map) at all. Greenpointers.com notes that the Meserole farmhouse once stood at 723 Manhattan Avenue in Greenpoint—which became the Meserole Theater in the 20th century, and now houses a Rite-Aid.